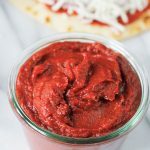 This Easy 5 Minute Pizza Sauce is filled with flavor using pantry staples you may already have on hand. After making this you’ll say goodbye to pre-made store purchased sauce. Place all ingredients into food processor, blender or medium mixing bowl, mix until well combined. Taste and adjust seasoning as needed. If a thinner sauce is desired add more tomato sauce. Store sauce in an airtight container in the fridge. This sauce can be frozen in freezer bags for three months. Thaw in the fridge overnight when ready to use.